What happens if you’re gaming on your desktop Windows PC, but want to continue the game from a different part of the house — or even out of the house? If you’re using Steam, Valve’s PC gaming destination, you can get around the first part of this dilemma by using Steam Link, an in-home game streaming solution that uses your local network. And now, there’s a way around the second as well — with some caveats. Valve has been perfecting its in-home streaming solution for five years now, so there’s plenty of polish in the setup process. However, the Steam Link Anywhere feature, which is part of the latest Steam Link beta (and which was only announced last month) lets you stream your game from anywhere using an Android device or a Steam Link box with an internet connection. Right now, this is a feature best suited for power users, so don’t be surprised if you can’t get it to work well. In addition, the mobile app is currently only available to Android devices (sorry iOS users). So, let’s get started on setting up Steam game streaming from one PC to another, or between your PC and your Android phone. This should maybe go without saying, but your network needs to be robust — if your Wi-Fi is weak, slow, congested, or there’s too much interference, you won’t see great results. With a wired ethernet connection, Steam streaming can feel practically seamless, but it can be completely unplayable with a poor wireless link. Just keep that in mind. Before you do any streaming (in-home or otherwise), you’ll probably want to download the beta version of the Steam desktop client for the most up-to-date experience. If you want to stream games to your phone, download the Steam link beta client to your Android phone using this Google Play Store link. If you’re streaming to another Windows computer, all you need is to have the Steam beta client installed there as well, with no additional software required. Select “Steam Beta Update” from the drop-down menu. Confirming this selection by clicking “OK” and it will prompt a restart of the Steam client. Wait for it to restart before going to the next step. 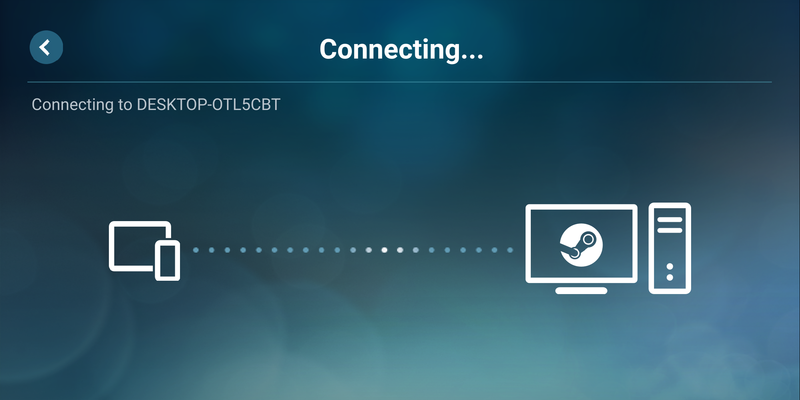 If you’re streaming to an Android phone, go to the Steam Link app settings on your phone and select “Other Computer.” A four-digit PIN will appear on your screen that you’ll enter on the desktop to complete the pairing process. If you’re using two PCs, you won’t need to pair them in order to stream in-home; just sign into the same account on the same network. Using the desktop Steam client, from the “In-Home Streaming” menu, select “Pair Steam Link,” and then enter the code seen on your phone. Make sure you’re on the same network, and follow the setup wizard until the pairing process is complete. On the same “In-Home Streaming” settings page from earlier (within the beta desktop client), select the “Set Security Code” button. Next, set a four-digit PIN by entering it into both fields, then click on the “OK” button. 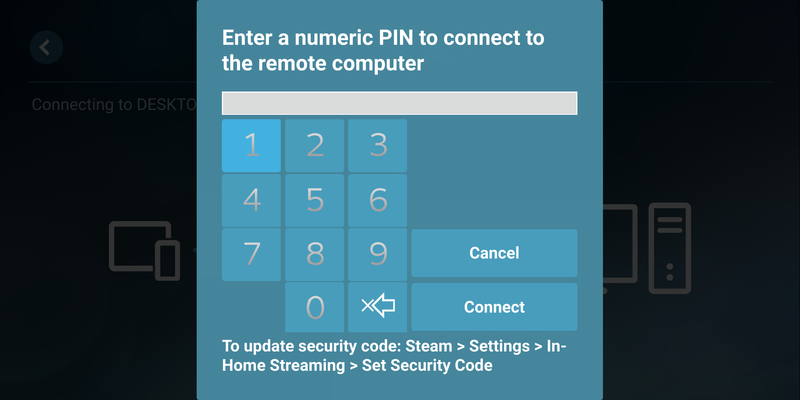 From now on, whenever you attempt to stream in-home or remotely, you’ll be required to enter the PIN. You’re finally through the beta setup process! As long as you stay logged in to both Steam clients, you should be able to quickly use Steam Link streaming when you’re on your own local network — or over the public internet, from your phone. More on that below. Entering Steam Link PIN on mobile. Connecting to host PC using Steam Link Anywhere. First, you’re going to need an internet connection with excellent upload speeds. Even if Comcast is giving you 150Mbps down, 5Mbps uploads aren’t going to cut it when you’re uploading a high-res video stream to the cloud. But assuming you’ve got that connection and assuming your devices are paired (see earlier steps), you can start streaming games over the internet. Currently, Steam Link Anywhere doesn’t support PC-to-PC streaming, but you can get it working with your Steam Link hardware or Android phone. For streaming from mobile, start up the Steam Link Android app and select the computer you added earlier. Select “Start Playing,” enter your four-digit PIN, and press “Connect.” Assuming your host PC isn’t asleep, it should transition to Steam Big Picture mode, while simultaneously delivering a stream to your phone. In my experience, there is a slight delay in camera and input controls when used over an LTE connection on mobile, but that can vary depending on your network and location. Additionally, you can select different control methods within the Steam Link mobile app. From the start screen of the app, tap on Settings, followed by “Controller.” From here, you can stick with Steam’s surprisingly robust and customizable touch input, or pair a controller to your phone that the host PC will recognize. Streaming games on your in-home network is basically identical to streaming over the internet. You simply need to be logged in to Steam (using the same account and network) on both devices, whether they be mobile or desktop. You don’t need the beta client for in-home streaming, by the way. With your host Windows PC (where the game streams from) and your stream destination (Android phone, another PC, etc.) set up, simply select a game from your library on the receiving device. On Windows PCs, this would involve going to your game library and clicking “Stream” on any of your games. On the Steam Link Android app, simply hit the “Start Playing” button. Both the host PC and receiver should now display identical streams of the game in question.